Having reiterated his stand on the controversial issue of reservation for OBCs in higher education, Union Human Resource Development Minister Arjun Singh today chose to dismiss the ongoing protests over the issue as mere “propaganda”. Medicos today intensified their anti-reservation protest in the Capital and several cities by striking work and disrupting services at state-run hospitals, causing hardship to thousands of patients. Do you welcome the Delhi High Court's decision to stop schools from interviewing children seeking admission into nursery classes? NRIs Get 75% off. Chat Now. Q: Should admissions to specialised courses be on the basis of caste or merit? In a surprising development in the killing incident of Indian engineer K. Suryanarayan in Afghanistan last month, a Taliban commander has claimed that the Hyderabad-based engineer was killed on the direction of Pakistan. Zabul province Commander of Taliban revealed this in an interview to a private Afghan television, Tolo TV. 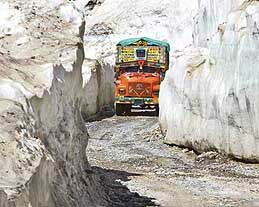 Pakistan is expected to respond to an Indian proposal on resolving the Siachen dispute when the two neighbours sit across the table here nine days later. In a significant development, the Congress-led UPA government is planning to introduce an amendment Bill in Parliament tomorrow, which would exempt National Advisory Council (NAC) chairmanship and 46 other posts from the purview of the office-of-profit. Rae Bareli no longer on CM’s ‘privileged’ list? Stung by the humiliating defeat of the Samajwadi Party candidate in Rae Bareli by Congress president Sonia Gandhi, Uttar Pradesh Chief Minister Mulayam Singh Yadav got down to making the electorate sweat it out — literally. Even as IATA has restored the ISO certification to Air India after a gap of more than two months and communicated the same to the carrier’s CMD V Thulasidas, another controversy appears to be brewing in finding a replacement for Capt M K Hathi as Director (Operations). Senior Congress leader, Jagmeet Singh Brar is said to have been summoned by the party high command to Delhi to explain his outburst against Chief Minister Amarinder Singh in respect of providing land to Reliance Industries.